We have reached Week 9 of the Kansas high school football season. While several district champions have been determined, the remainder of the playoff tickets will be punched this week. Let’s take a look at the Week 9 Kpreps.com rankings powered by Pinamonti Physical Therapy. Gardner-Edgerton won the battle of ranked teams in Class 6A from a week ago. The No. 4 Trailblazers trailed Olathe North for much of the game and things looked bleak with a fourth-and-8 deep in their own territory with around two minutes remaining. Jaylon Radel hauled in a tipped pass and took it 75 yards for a touchdown to propel the Blazers to a dramatic 29-26 win. Olathe North falls out of the 6A poll and is replaced by Blue Valley Northwest. The Huskies have won five consecutive games after consecutive losses to Gardner-Edgerton and Bishop Miege early in the season. Derby, Lawrence Free State, and Shawnee Mission East remain in the top three spots in this week’s poll. There are no changes in this week’s 5A poll as top-ranked Bishop Carroll, No. 2 Miege, and No. 5 Mill Valley all rolled to shutout wins. Blue Valley held of Pittsburg 35-14, while No. 4 Salina South outscored Hays 56-34. The Class 4A poll also remained the same from Week 8. Holton won their annual district battle with Topeka Hayden getting a fourth quarter field goal and touchdown from Brenden Hampton to pull away 31-14. Andale and No. 3 Baldwin rolled to big district wins, while No. 4 Buhler welcomed the return of running back Riley Allen in a 34-12 victory over Cheney. Paola rolled to a big win over Prairie View ahead of their annual Week 9 district showdown with rival Louisburg. All five teams in the Class 3A poll rolled to district wins on last Friday night. Conway Springs avoided a repeat of last season’s 84-56 shootout win over Chaparral, but the two teams still combined for 78 points in a Cardinal win. Remember, that’s the game where Tanner Wood set the state single game rushing record with 659 yards and nine touchdowns. In Class 2-1A, No. 3 Meade used a big night on the ground from Morgan Olvera in topping previously unbeaten Elkhart, 28-6. 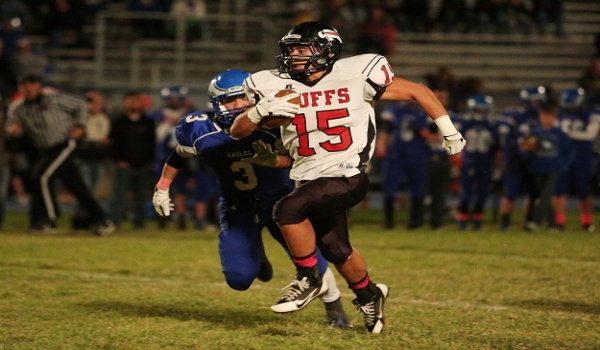 Olvera rushed for 155 yards and four touchdowns for the Buffaloes. Top-ranked Centralia, No. 2 La Crosse, and No. 5 Lyndon all posted blowout wins, while No. 4 Oakley had the week off in preparation of their final district game at Ellis. The most shocking score in the state last week may have been Peabody-Burns rallying from 28 down to upset previously No. 1 Madison 40-34. The Warriors scored with just over two minutes remaining to overtake the Bulldogs. Madison drops two spots to No. 3 this week, while Osborne is the new No. 1 leaping No. 2 Kiowa County. The Bulldogs have been impressive as of late with a barrage of offensive weapons. Marais des Cygnes Valley and Atwood-Rawlins County round out the top five this week. Michael Capo led Rawlins County to a 42-22 win over defending champion Ness City by rushing for 238 yards and four touchdowns. Baileyville B&B topped Hanover for the eighth straight time with a 34-22 road win. Quarterback Dustin Rottinghaus passed for 344 yards and two touchdowns and rushed for two more to lead the Falcons. Hanover still had a chance to win the game late in the fourth quarter with the ball and trailing 26-22, but B&B’s Dylan Schmitz returned an Andrew Bruna interception for a touchdown to seal the Falcon win. Despite the loss, Hanover stays put at No. 3 in this week’s poll with both of the Wildcats’ losses coming to the state’s top two teams in B&B and No. 2 Sharon Springs-Wallace County. Victoria and Beloit St. John’s-Tipton remain ranked No. 4 and No. 5 after posting blowout wins last week.